In some circumstances, your cracked floor is actually a symptom of foundation problems, which can lead severe structural issues for your garage. Total collapse is possible if not repaired soon. Select a filler or topper that meets your needs. Hardware store employees are often savvy enough to help you select the product that meets your requirements. Fill the crack or pit with the compound. Remember to always read your product’s instructions for helpful tips and special considerations. Allow to harden and dry. The time required for this varies from product to product. This also should be listed on the product’s label. 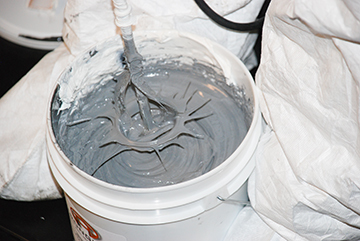 Apply a cement sealant to help prevent the damage from reoccurring. 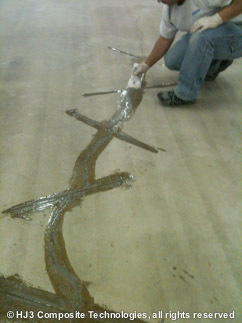 StrongHold’s laminate strips confine concrete cracks. 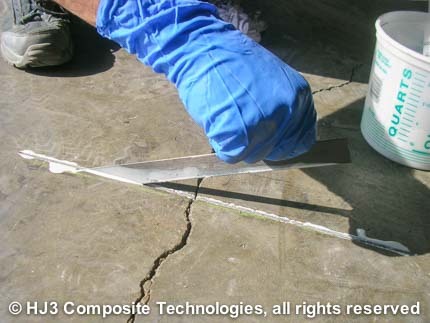 If you’re looking for a more thorough concrete crack repair and confinement, StrongHold™ has developed a superior carbon fiber solution that will both confine your cracks and make them less visible and less dangerous. Although slightly more involved than using a simple crack filler, the process is still very simple, and far more economical than re-pouring a new garage floor. After thoroughly cleaning the area of dust, debris, and oil, use a concrete saw to cut a 26″ line perpendicular to the crack(s). Make this same saw cut every 2 feet along the length of the entire crack. 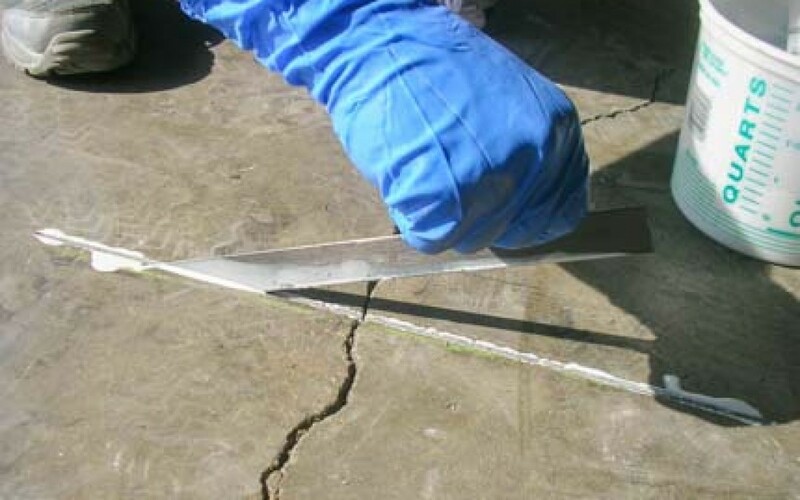 Since concrete cracks are rarely perfectly straight, your saw cuts probably won’t align with each other. What’s important is that each saw cut is perpendicular to that part of your concrete crack. Cut the StrongHold™ laminate strips into 24″ lengths with a circular saw. Cracks in your garage floor are often a symptom of an underlying problem. Most garages, just like your home, have a foundation beneath them, which makes up the garage floor. 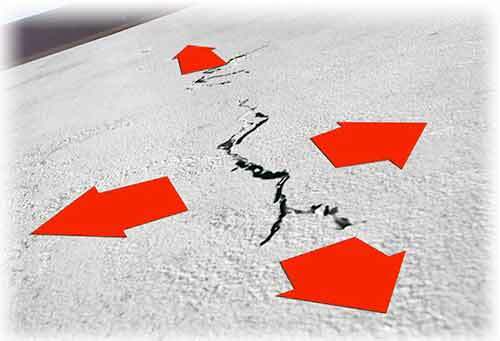 Therefore, cracks and pits in your floor are cracks and pits in your foundation. This is especially troubling if you have an attached garage on the same foundation as your home. You may want to call a foundation expert to properly diagnose your home’s safety. Looking for more information about StrongHold’s concrete crack repair kits for garage floors, or are interested in having a professional, certified installer perform your concrete crack repair project? Contact us today at info@hj3.com or 877-303-0453.